In a market like this one, it’s impossible to tell what is going to happen next. The smell of fear has been in the air with greed cowered by uncertainty. Greed may push back soon with earnings, and particularly guidance, dictating the short term path whilst oil and China, amongst other macro factors, will continue to dominate the overall direction. Overall I remain cautious on equities with a downward bias. I am sticking to my conviction stocks whilst keeping cash on the sidelines until I find a blatant bargain or two. Notwithstanding that stance, it’s always good to look at your positions and see if some risk management re-weighting is called for. 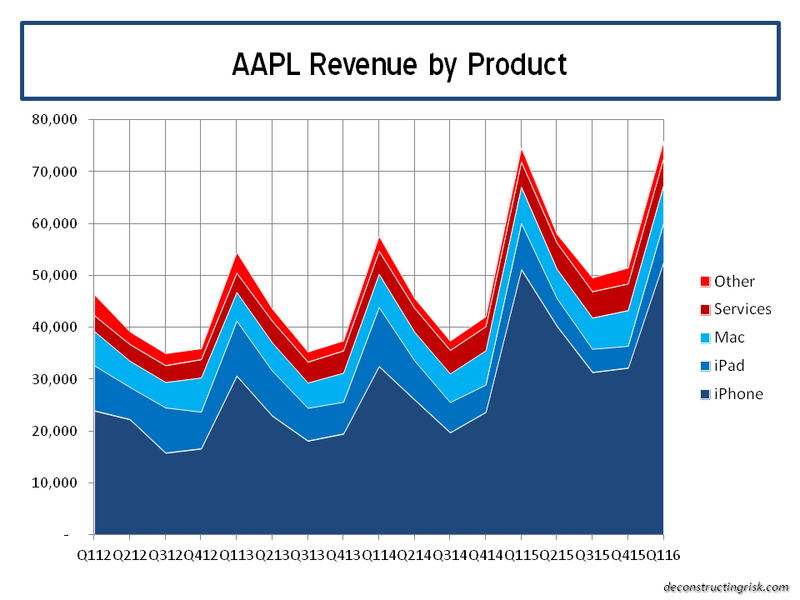 And that’s the reason for a quick look over Apple before its earnings next Tuesday. 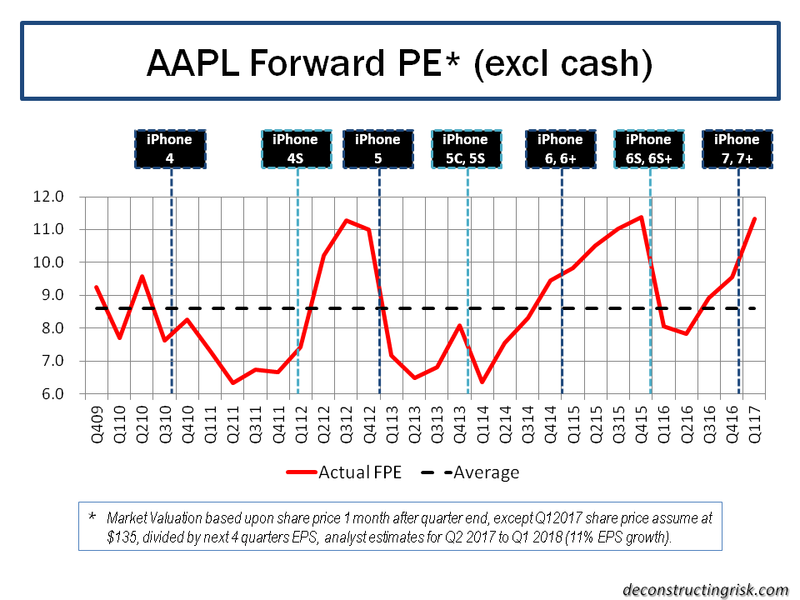 Apple is in a hapless position currently and likely has to blow away the December quarter estimates (on the number of iPhones sold, the average price, and the gross margin received) PLUS give a strong March quarter guidance to move up in a meaningful way. Given that a repeat of the outstanding results of last December’s quarter (see post here) compared to current expectations is improbable, I would suggest Apple could trade around or below $100 for a while yet. Analysts, whilst screaming about its valuation, have become increasing negative on the December quarter and guidance for their Q2 quarter. Apple may struggle to come in much above the top end of its guidance of 77.5 million iPhones (it has come in above guidance for 5 consecutive quarters albeit at a steadily reducing level above the top estimate). The geographic split of revenue, as per the graph below, will also be closely watched to see if China’s economy is impacting Asian growth. Despite its best efforts, Apple remains primarily a phone company with last year’s iPhone revenues making up two-thirds of the total, as per the graph below (with my estimates for Q1). 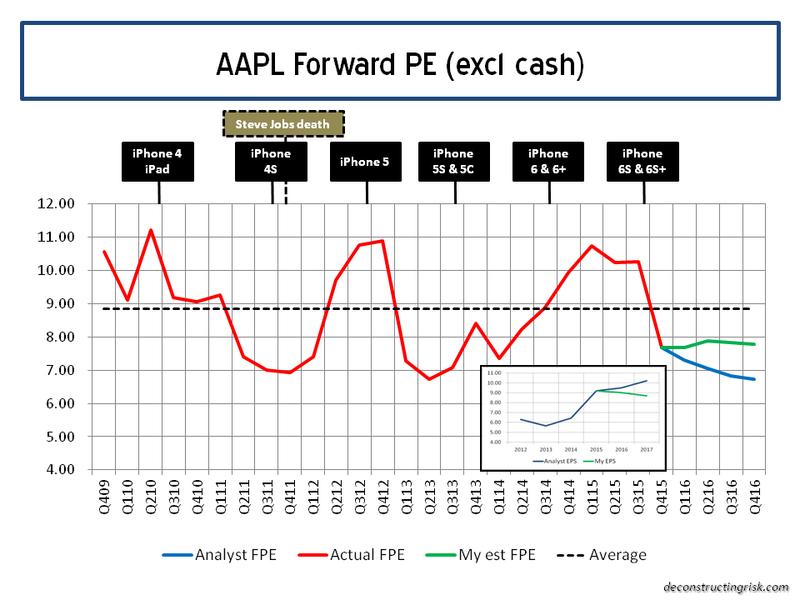 I played with some estimates to stress the view on an AAPL valuation below $100. Taking a jaundice view of adjusting average analyst non-GAAP estimates for 2016 and 2017 plus some pessimistic estimates of my own on 2016 and 2017 (with iPhone slowing to sales of 220 million and 200 million compared to around 230 million for 2015), I estimated the forward PEs, excluding net cash (currently around $150 billion), as per the graph below (based upon diluted GAAP EPS, not the adjusted EPS analysts love) using tonight’s close of $96.30. 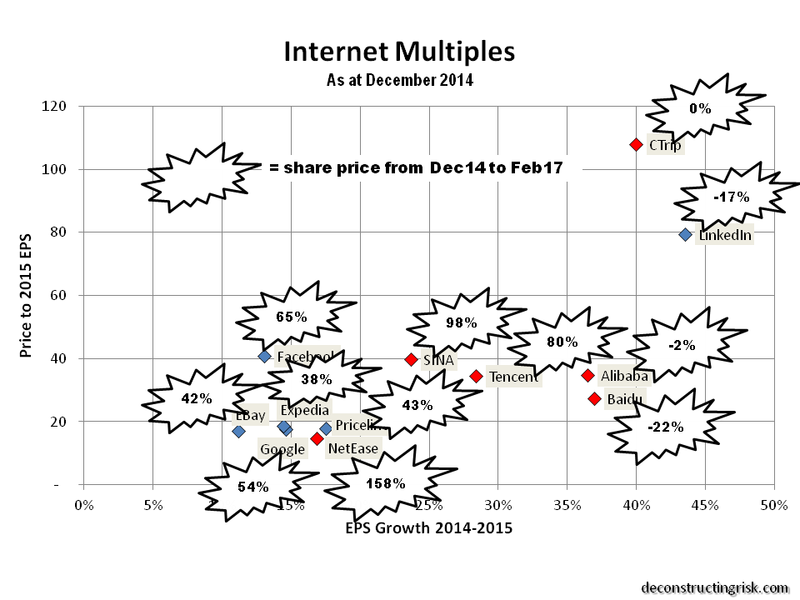 The multiples are quarterly point estimates using the share price one month after the quarter’s end. The graph above clearly shows the swings in sentiment on Apple over recent years as the market grapples with the future demand for the iPhone after each upgrade cycle. Tuesday will indicate whether the current concerns about iPhone sales and margins peaking are justified. Other concerns, such as a possible $8 billion tax bill from the EU, pale in comparison to those iPhone concerns. Notwithstanding these real concerns, forward multiples of below 8 look too low to me given Apple’s operating record (unless you buy into the Apple could be the next Nokia thesis which I don’t). 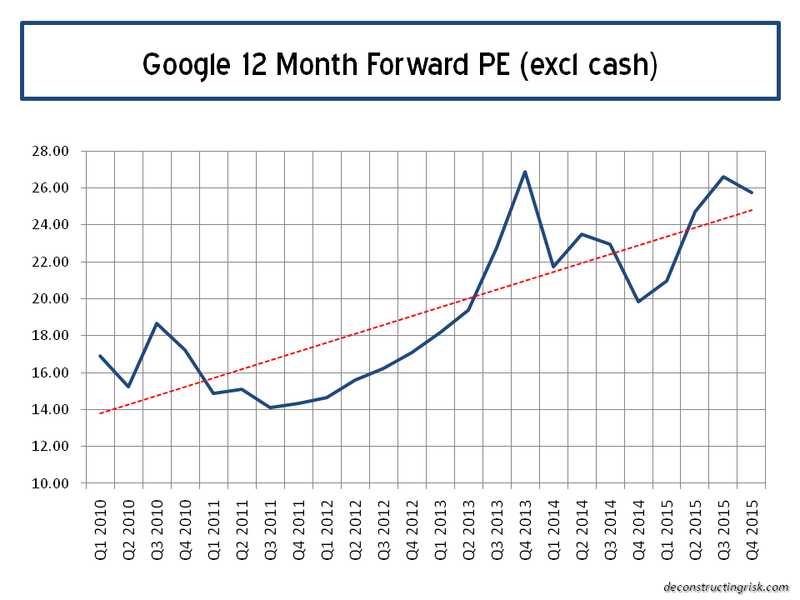 By way of a comparison, my estimate for a similar graph for Google is below (again using diluted GAAP EPS). Google will be another stock where earnings for Q4 will be very interesting as they split out their figures in line with the new Alphabet structure and (maybe) demonstrate again their new emphasis on cost control. Expectations look high based upon its current valuation. The comparison does reflect positively on Apple’s current valuation multiple and I’m happy to hold the AAPL position I have. A key outcome from the AAPL earnings call will be if Cook can provide sufficient catalysts for Apple’s value to trade significantly above $100. Follow-0n Evening 26th after earnings: Over the next few days and weeks, I’m sure the chatter about Apple and the iPhone will likely get over-bearing. The delicately posed share price of $99.99 before earnings will come under pressure. Q1 revenues were at the lower range of expectations and Q2 guidance at $50-$53 billion is weaker than expected. China revenues showed slowing growth. 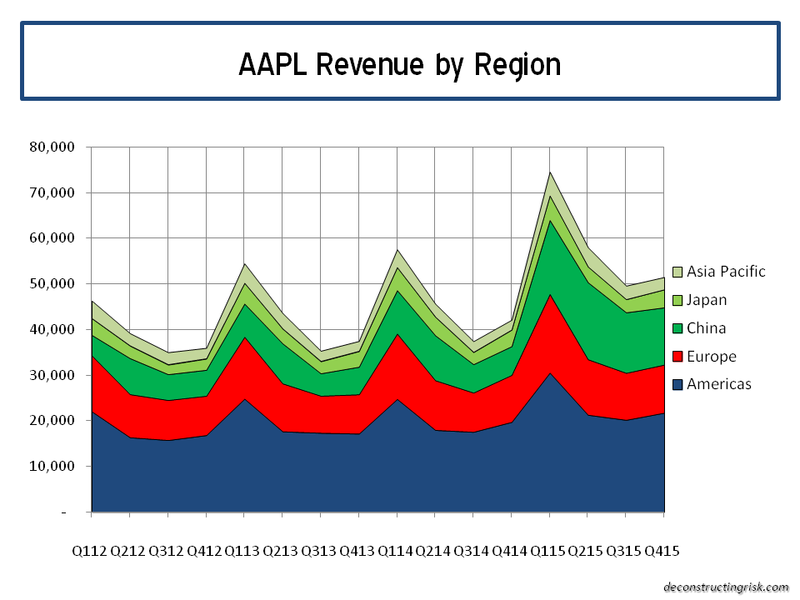 On the positive side, the average revenue per iPhone in Q1 was higher than expected and operating margins were strong. I revised down my estimates for AAPL’s 2016 and 2017 diluted EPS (to $9.15 and $8.60) and iPhone sales to 210 million and 190 million. 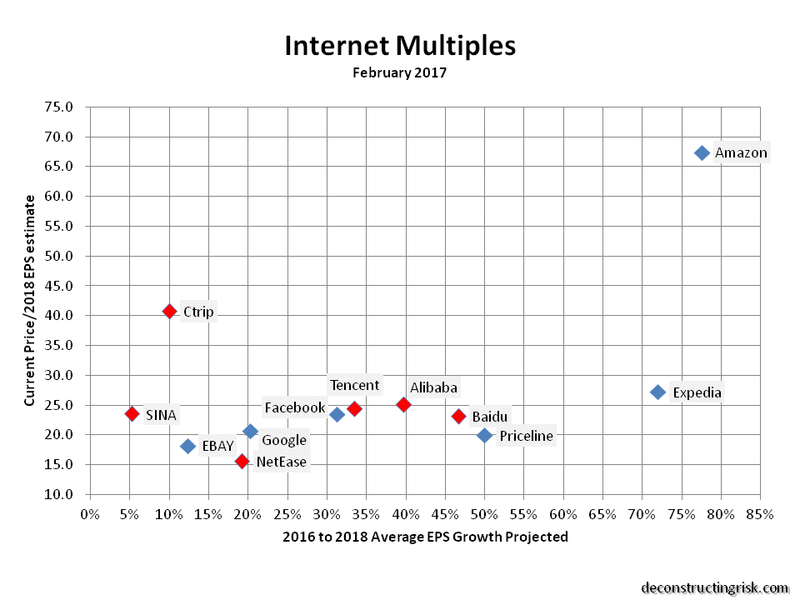 The revised revenue splits and forward PE multiples (at share price of $99.99) are shown below. Thesis, as per post above, on AAPL’s valuation remains basically unchanged although the share price see some selling pressure in the short term.